Voice International Music Awards (VIMA), the music recognition platform is now open for submissions from Malaysia, Singapore and Brunei. The award has become a benchmark for many awards platform across the globe and often acts as a launch pad for music acts tipped to be the next big thing. Some of the past winners include Yuna, Altimet, The Great Spy Experiment (Singapore), Joe Flizzow, Project E.A.R (Malaysia, Singapore, Thailand, Indonesia), Prema Yin, K-Town Clan, Ze Rebelle, Sasi The Don, Alex Subryn, An Honest Mistake, Inch Chua (Singapore), Feez Madea (Brunei), Electrico (Singapore), Pop Shuvit, Melissa Indot and many more. VIMA was started 8 years ago to help struggling musicians in Malaysia carve a name in the industry. It’s amazing to see after so many years, the regional music scene is still alive and kicking. The award platform is unique for allowing submissions from bedroom DJs, college acts, concert performances and even demo versions. It also champions singles rather than albums and recognizes songs of all languages in all genres including electronica, hip-hop, metal, pop, dance, rock and mash-ups/remixes. VIMA is expected to be held in the 3rd week of July, and over the years, many of its mini events and grand finals have been hosted at various locations across Klang Valley. One of its biggest supporters is Laundry@The Curve, a venue that has supported countless number of emerging talents as well as award winning ones from the independent scene. As in previous years, VIMA has always championed social media as the main platform to engage and reach out to musicians and fans. One of the crucial elements of the competition is also to see how well musicians are interacting and promoting their music to their fans and in the music industry. 1. Eligibility for songs and music videos – must be released between June 1st, 2014 and February 14th, 2016. All musicians are requested to send in their song entries as Soundcloud links (www.soundcloud.com) and also every participating musician is encouraged to have a Facebook account. 2. For music videos, musicians are requested to submit videos as Youtube links. 3. Musicians are allowed to submit as many songs in as many categories . 6. The closing date to submit all songs and videos will be at 5pm March 31st, 2016. 7. Musicians from countries outside Malaysia, Singapore and Brunei are allowed to participate if they have resided at least 3 years in the country and shows proof of continuing to stay on for a further 2 years. In the past musicians (mostly students) from African countries and Europe have gained eligibility via this route. 9. The judging is divided into : 10% social media engagement with fans (Facebook, Twitter, Youtube), 30% FB public votes, 60% global judges. 10. Musicians may submit the same song for multiple categories and also as many songs into as many categories. VIMA was founded in 2008 by Siva, Tevan and Premo, 3 passionate individuals who wanted to help elevate and grow the independent music scene in Malaysia. 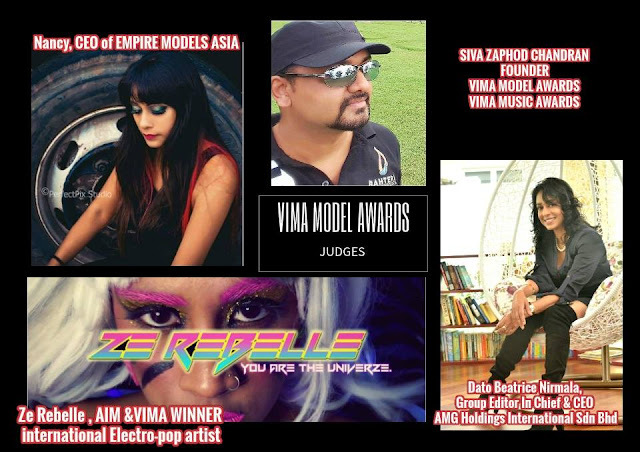 VIMA was formerly known as Voice Independent Music Awards and was the first awards of its kind in Asia when it was launched 8 years ago. 1. Will Baker – USA (Grammy nominated Producer/Songwriter for Pink, India Arie, Beyonce, Boyz II Men). 2. Moonshyne Brown – USA (Grammy Nominated producer/songwriter for Ludacris/Curtis Mayfield). 3. Eva Dowd – USA (Award Winning International Public Relations Manager and Industry Member at the Grammy Recording Academy). 5. Fatiniza –UAE (Top 5 Best-selling artist ever in UAE, and voted top 5 most influential International Colombians in the Music World). 6. Chris B – Hong Kong (founder of the Underground Hong Kong, a platform championing independent acts in China/HK and winner of Indie Music Champion of the World 2014). 7. Seraphim Ward – USA ( Occult/Horror film director and singer). 8. Empire Isis – Jamaica ( Singer-Songwriter. with songs that have appeared in many renowned TV, movie and advertisements including Khloe & Lamar, Cover Girls ads (Drew Barrymore & Queen Latifah) and also the HBO TV series Girls Season 5 "Get Up On it). 9. Kristina Lao – Hong Kong (Singer-songwriter and actress in the lead role of the Oscar qualifying short film Sick to my bones). 10. Greg Jackson – USA (Entertainment attorney, business advisor and former International manager for THAITANIUM (No.1 Thai act), and one of the leading multi-award winning hip hop groups in Southeast Asia). its good to have this kind of award so that many more talented musicians show their creativity in music. good platform for a newbie too. How to Boost Your Skin Luster While You Sleep? Batman v Superman: Dawn of Justice Who Will Win? Who Will Be Asia’s Next Top Model Season 4?